Denta-Gard is sensitive to our customers needs for latex free mouth guards. Through the years studies have shown an increasing number of people have latex allergies, which points up the importance of latex free mouth guards. 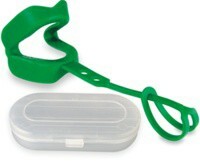 If you, a family member or a friend have allergies to latex, seeking a latex free mouth guard is extremely important. Not all mouth guards are latex free mouth guards. In fact, the majority of mouth guards contain latex. When buying a mouth guard, be sure to look for Latex free on the package insert. Denta-Gard is made of FDA approved materials. We invite you to browse our website to learn about using the Denta-Gard® as your mouth guard. Be sure to watch our demonstration video on our home page.